Don't leave home without your armor! 1:6 scale prop replica statue of the foot soldier's battle armor. Inspired by the 2016 adventure/fantasy film Warcraft. Meticulously crafted by Weta Workshop. You'll need this to battle the Orcs. 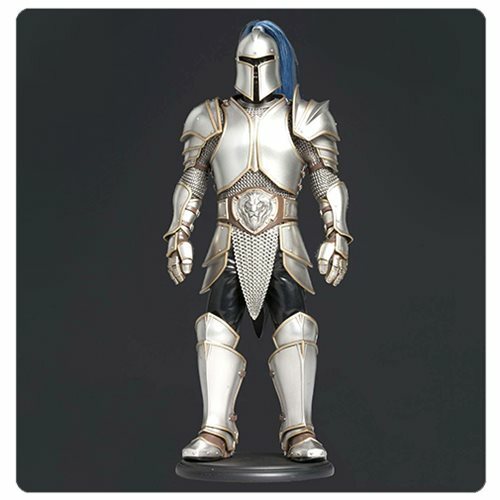 The gallant armor of the foot soldiers seen in 2016's adventure/fantasy film Warcraft is faithfully reproduced is this stunning 13-inch tall polyresin statue! This Warcraft Foot Soldier Armour 1:6 Scale Prop Replica includes a base and does not feature articulation. Ages 14 and up.